It's Video Poker Quiz time! Your knowledge about specific versions offered in VP land and VP lingo is tested with 10 questions and answers about video poker games. If you are a novice player, this quiz is a good beginning towards your VP education. For veteran players, there are some challenging video poker game questions just for you with this video poker quiz at gamerisms. Let’s push that deal button to begin. 1) What is the difference between ‘Full pay’ and ‘Short pay’ Video Poker games? A. ‘Short pay’ VP pays higher coin for better hands, e.g. (4-of-a-kind). B. ‘Full Pay’ VP offers the best payback overall, while ‘Short pay’ VP reduces the payback for certain hands. C. There is no difference as the overall payback will be the same if you play optimum strategy. 2) Double Bonus full-pay Video Poker pays? for a full house with max coin? 3) Jokers Wild video poker games full-pay 7/5 version has a 100.64% overall return IF the quad pays? A. If the quad pays 75 for max coin play. B. If the quad pays 80 for max coin play. C. If the quad pays 100 for max coin play. 4) For Bonus Video Poker, what are the payouts for 2 pair and 4 Aces with max coin in play? A. 5 for two pair and 400 for 4 Aces. B. 10 for two pair and 400 for 4 Aces. C. 5 for two pair and 800 for 4 Aces. 5) Pick ‘Em Poker video poker games pay 2-1 for a pair of? A. Pair of 8’s or better. B. Pair of 9’s or better. C. Pair of 10’s or better. 6) Double Double Jackpot Poker, also known as Aces & Faces video poker game pays a bonus if the fifth card with 4 Aces is? A. King or Queen only. C. Any King, Queen or Jack. 7) Which VP game version offers a payout of 1000 coins for a straight flush? C. Triple Double Bonus Poker. 8) What is a dirty Royal in reference to video poker games? A. 4 Parts of a Royal dealt. C. Wild Royal that includes 1 or more wild cards, example: Deuces or Jokers Wild. 9) With 4 Aces, what is the fifth card or kicker required in Super Aces/All Aces VP? A. 2, 3 or 4. B. None. Does not require a ‘kicker’. C. King, Queen or Jack. 10) What is an ‘Easy Royal’? A. Four parts dealt and one card will ‘do the trick’. B. Royal after you Hold card(s) and hit the Deal button. C. Royal Flush dealt to you. Answers to Video Poker Quiz. Was your score in the quads or better range? 1) B. ‘Short pay’ VP reduces the payout for certain hands, e.g. straight, full house usually by 5 coins thereby reducing the overall payback for that version. 2) B. 10/7 Double Bonus Video poker games pay a generous 50 coins for a full house. 3) C. While there are several 7/5 Jokers Wild versions available, not all pay 100 for a Quad (4-of-a-kind). 4) B. 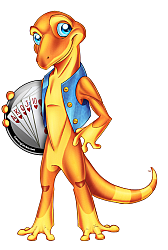 Bonus VP treats you with a better payout for 2 pair than 1 pair and more for 4 Aces than Jacks or Better plus 200 for quad 2’s, 3’s and 4’s. 5) B. This popular VP version also pays for a pair of 9's or better and is the easiest video poker game to learn. 6) C. Bring on the Royalty be it King, Queen or Jack for extra coin with 4 Aces. 7) A. All American video poker games pays 1000 coins for a straight flush--very rare in VP land. 8) C. While it pays 125 coins with Deuces Wild video poker games, it ain’t the clean payday expected. 9) B. Wow, no fifth card required and a 2000 coin payday, that’s way cool for video poker players! 10) C. Dealt to you is the ‘easy’ way, but let’s not be fussy for ‘All of the Above’ is also an acceptable answer. 1) As the progressive jackpot grows, at what $$ point is my cue to play this quarter denominations of Jacks or Better? A. Play when this Jackpot reaches $2370. for an 8/5 version. B. When the progressive Jackpot reaches $1850 for an 8/5 version paytable. C. When the Jacks or Better Jackpot is over $1250 for an 8/5 version. 1) A. Grab a seat and play for this progressive VP game is about to ‘pop’. Alternatively, C is correct IF you were playing a 9/6 version, although unlikely to be available as VP progressives generally have lesser payouts for full house/flush. At gamerisms.com, we are attentive about getting the word out about the language of sports and games; however, we ask your assistance and consideration in promoting us. Click link below that reads, "Enjoy this page? Please pay it forward. Here's how..." to add a link to your site, blog or personal page. Along with Video Poker Quiz, there is a 3-part Video Poker Glossary at gamerisms.